As it happens for the Board Win Client it is now possible to export from any Object (with a Layout) of the Board Web Page (Screen), Data, in MS Excel Format file. Click on the 'Export Data' icon of the drop down menu of the object which layout data you like to export in MS Excel. Clicking on Export, data are 'exported' and a new MS Excel File is open. 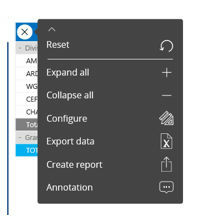 If you click on Export Data from the Screen 'Open Menu' all the Object Layouts of the Screen are exported together in several and distinct (per layout) worksheets of the same MS Excel workbook.